Trump’s possible homeland security secretary flashes horrifying immigration plan. President-elect Donald Trump greets Kansas Secretary of State Kris Kobach at the clubhouse at Trump National Golf Club Bedminster in New Jersey on Sunday. Kris Kobach, the controversial secretary of state of Kansas known for designing a largely unconstitutional Arizona immigration law, met with President-elect Donald Trump on Sunday. We now know he was there to discuss his plans for what a Department of Homeland Security might look like under a Secretary Kobach and what some of those plans might be. We know this because Kobach showed us, flashing a document titled “Department of Homeland Security Kobach Strategic Plan for First 365 Days” during a photo op with the president-elect. Whether or not he intentionally wanted us to see those plans, which Kansas Senate Minority Leader Anthony Hensley told the Topeka Capital Journal‎ ought to have been confidential, remains to be seen. Kris Kobach’s plans and solutions (image is a crop from a larger frame, rotated 90 degrees clockwise to make paper legible). 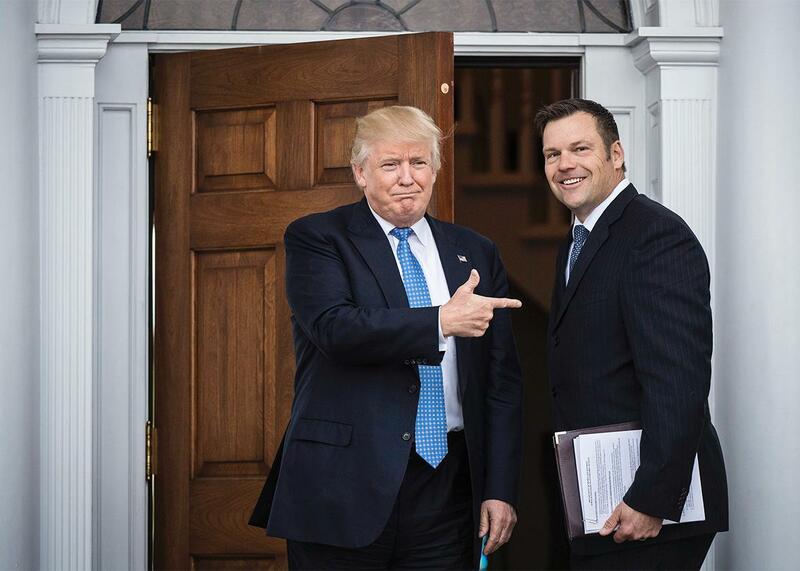 Since the election, Kobach has been out on the press circuit advocating for a Muslim immigrant registry in the Trump administration, specifically a return to the National Security Entry-Exit Registration System he helped design after the 9/11 attacks but which was scaled back in 2003 amid civil liberties concerns and done away with in 2011.
required noncitizen men from certain Muslim-majority countries living in the U.S. to register and continuously update the government about their whereabouts. It also required individuals to go before immigration officials for fingerprinting, photographing, and comprehensive questioning. Trump’s transition team had previously denied he was considering a Muslim registry. During the campaign Trump said on video that he’d consider such a registry and called for a ban on all Muslim immigration. 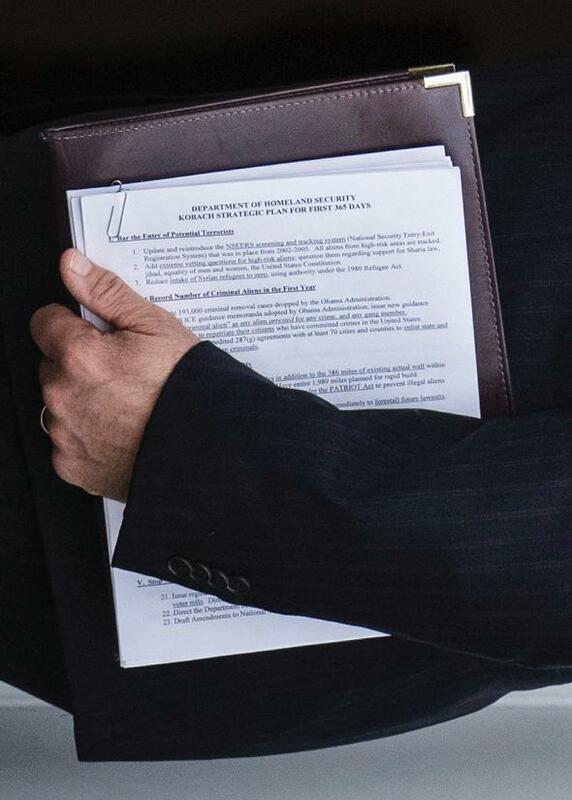 An obscured portion of the Kobach document also showed what the administration’s plans might be for non-Muslim immigrants, who were the subjects of some of Trump’s harshest and most racist invective during the campaign. It says that a Kobach-led Homeland Security Department would do something that was covered by his hand to a “record number of criminal aliens in the first year,” which we presume might have been the verb deport. That obscured portion also seems to call for potentially classifying said criminal aliens “as any alien arrested for any crime, and any gang member.” The italics are Kobach’s. In an interview with CNN last week, he was evasive on this very topic of who would qualify as a deportable criminal alien under a Trump administration. [CNN’s Brianna] Keilar pressed Kobach further, asking what kind of criminal record an individual would need to merit deportation. Without offering definitive specifics, Kobach said that the definition of a deportable offense would need to broaden under Trump, to include “any felony” and then perhaps those arrested but not yet convicted in some cases. “That’s what this administration will probably do and what the Obama administration has not been doing,” Kobach concluded. So, to summarize: Kobach—who is famous for having crafted an unconstitutional law that would have allowed for law enforcement authorities to conduct warrantless arrests of immigrants they suspected were here illegally—apparently wants to classify any immigrant who has been arrested as a “criminal alien.” And he and Trump want to deport all criminal aliens. And this is the man who might be our next secretary of homeland security and in charge of these matters.